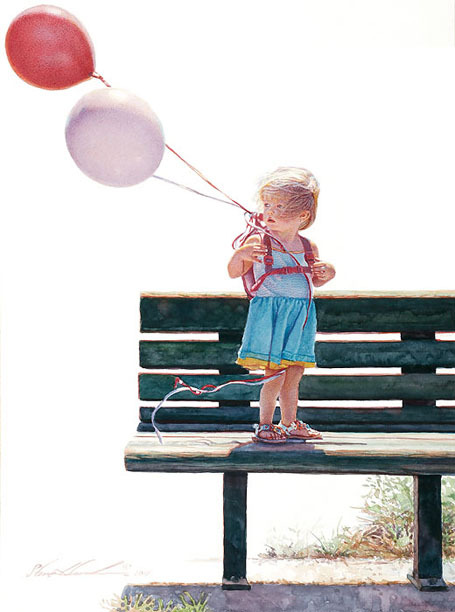 Artist Steve Hanks tends to explore memories and emotions through his painting, rather than convey a specific message. “Art is an escape to somewhere you want to be or a feeling you want to have,” Hanks says. In this darling portrait of youth and innocence, the girl is alone but not lonely. She’s looking in the direction that the wind blows. Bright, cheerful colors of childhood spread against a blank background that is the future she will both meet, and create. Meanwhile, what’s more sturdy than a wooden bench bolted into concrete? The music of the 1960s, especially Bob Dylan, often accompanies the artist as he paints in his studio so the title of this painting was close at hand as he put the final touches on this jewel that is poetry in motion.